The newest edition of the Handbook of United States Coins debuts in late May 2018. 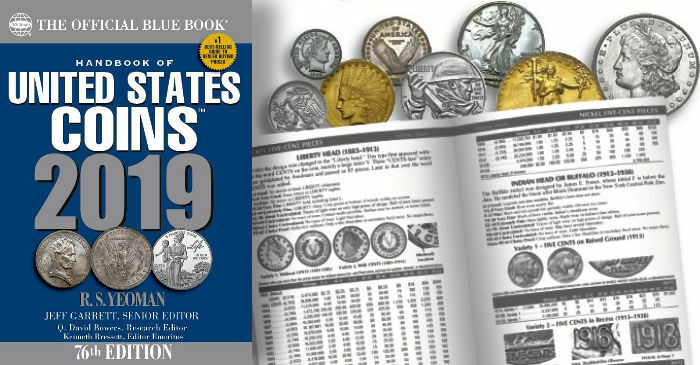 Known to collectors as the Blue Book, it is the best-selling annual guide to wholesale prices paid by U.S. coin dealers. The 304-page 76th edition, with a 2019 cover date, has been fully updated and expanded with a 16-page color section. It can be ordered online in two formats—hardcover at $14.95 and softcover at $12.95—and will also be available from booksellers and hobby shops nationwide. The Blue Book was introduced in 1942 as a resource for coin collectors to learn how much dealers were paying, on average, for U.S. coins. Whitman Publishing’s R.S. Yeoman, who was in charge of promoting the company’s line of coin boards and folders in the 1930s. He realized that coin collectors needed other resources and supplies for their hobby, and he began gathering mintage data and market values. Yeoman’s coin-by-coin, grade-by-grade research grew into the Blue Book. It has been published every year since 1942 (except for 1944 and 1950), with millions of copies purchased by collectors and dealers. 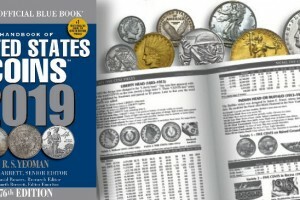 Today’s Blue Book has more than 25,000 wholesale valuations in up to nine grades per coin type. It covers U.S. coins from copper half cents through gold double eagles, plus commemoratives; Proof and Mint sets; silver, gold, and platinum bullion coins; private and territorial gold pieces; private tokens; and 1903–1945 Philippine coins struck under U.S. sovereignty. This year longtime editor Kenneth Bressett is retiring to the position of Editor Emeritus, with Valuations Editor Jeff Garrett taking the role of Senior Editor and Q. David Bowers continuing as the Blue Book’s Research Editor. Read more and see preview images at Coin Update News. ← Reserve Your Room A Few Steps Away From The Whitman Baltimore Expo!